Malcolm has been in the retail industry for over 40 years. He started his career in retail management working for Clarks and then moved into the buying side with Clarks based in Street, Somerset. This covered buying for their own retail stores as well with the wholesale and manufacturing teams. He then joined New Look to set up the footwear business. Following early success drove New Look to be the major retailer of footwear in the UK. This then also included the success of all areas of accessories to become destination stores for footwear and accessories. 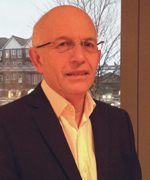 Malcolm now runs his own retail consultancy business covering retail, buying and sourcing. He is now a committee member of the Footwear Friends industry charity.